The Globe Guide to Shakespeare is the ultimate guide to the life and work of the world's greatest playwright: William Shakespeare. With full coverage of the 39 Shakespearian plays, including a synopsis, full character list, stage history and a critical essay for each, this comprehensive guide is both a quick reference and in-depth background guide for theatre goers, students, film buffs and lovers of literature alike. The Globe Guide to Shakespeare also explores Shakespeare's sonnets and the narrative poems, combined with fascinating accounts of Shakespeare's life and theatre, exploring in colourful detail each play's original performances. This comprehensive guide includes up-to-date reviews of the best films and audio recordings of each play, from Laurence Olivier to Baz Luhrmann, Kozintsev to Kurosawa. 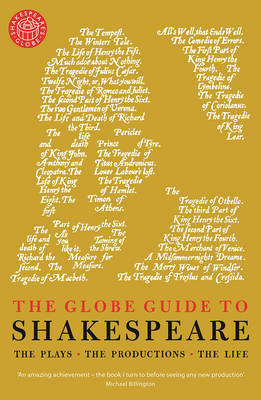 The Globe Guide to Shakespeare is a celebration of all things Shakespearian. Andrew Dickson has been an arts editor at the Guardian and is now a freelance writer and critic, who has also written for New Statesman and Sight and Sound among other publications. He has contributed to The New Cambridge Companion to Shakespeare (2010) and is currently an honorary research fellow at Birkbeck, University of London. He is a regular on BBC radio as a presenter and reviewer, and is author of the forthcoming Worlds Elsewhere: Journeys Around Shakespeare's Globe, a book about Shakespeare's global influence.